My turkey dinner menu is non-negotiable. I cater to the guests favourites. This is not the time for me to get creative with the dishes. So in that way it is an easy meal to prepare. It becomes a buffet of everyone’s wants. At best, I can play around with how I make the turkey. I usually brine it and this year I tried Martha Stewart’s cheesecloth method. These two things are supposed to be about making the meat juicy and flavourful. Who could object to that? But there must be mashed potatoes for the teenager and roast potatoes for the MIL. The mister wants the stuffing and the teenager insists it is the ‘usual’ recipe from my side of the family tree. The 10 cent braised red cabbage (rødkål) is something I insist on and would feel hollow without it. The basic steamed peas and carrots are also the request of the teenager. After all, Grandma always made them with any roast meal. The MIL has a soft spot for the roasted parsnips and carrots. So before you can get any kind of fancy, the plate is full. Other visiting guests have wanted squashes. But not this time. Typically there isn’t a big interest in anything cranberry. This year I sprung for Michael Sunderland’s michaelsdolce™ Cranberry and Apricot jam. We all loved it with the meat. There is plenty of choice, it is simple, and the plate is full. In the end, in my opinion, it comes down to piping hot delicious gravy. 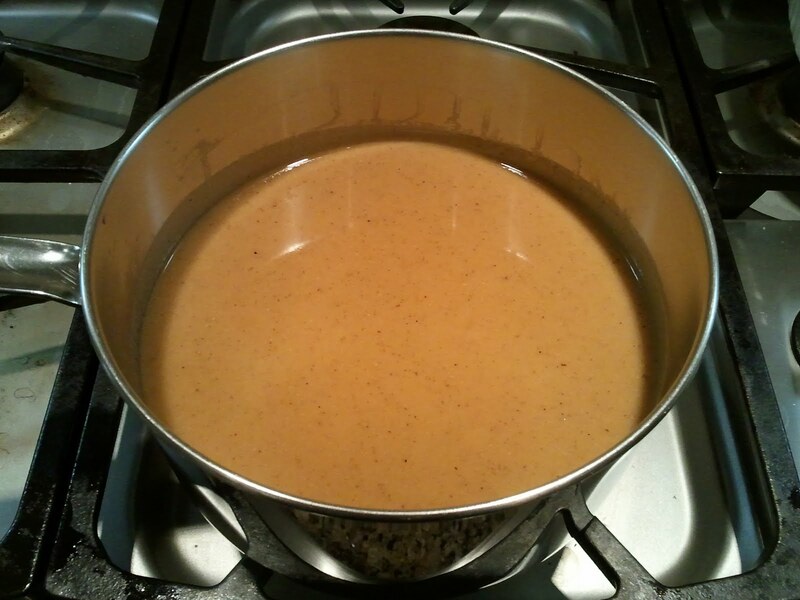 My gravy recipe is timeless and something that has been done my way for some 20 plus years. It now is the family tradition. Christmas is 76 days away. Tuck this recipe in a safe spot and give it a try with your December turkey. * I used potatoes, carrots, celery, onions and red cabbage from Roots and Shoots Farm for our Thanksgiving dinner. Put all the ingredients in a saucepan. 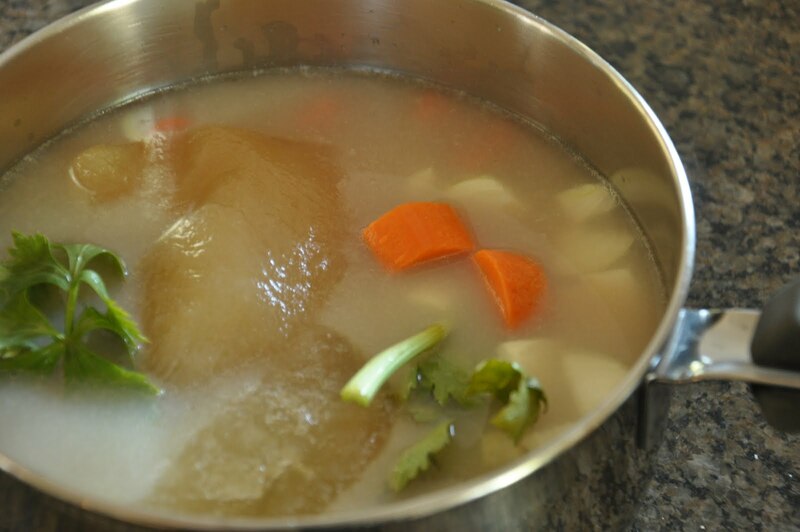 Make sure the turkey stock is cool to start and not hot. This is important for drawing out the flavours from the neck and giblets. Bring to a boil and then reduce the heat. Simmer for 3 hours. Strain out the juice from the giblets and vegetables. It should measure about 4 cups. Scrap the pan drippings into a bowl. The fat will rise to the top. Skim off all the fat and leave the flavourful, dark pan drippings for later. If you don’t have enough fat from the roast, use butter as well. Pour the giblet stock into the roasting pan and bring to a boil in order to de-glaze the pan. There will still be a lot of flavour stuck to the bottoms and sides. Heat turkey fat in a saucepan. But make sure it doesn’t get too hot or it will start to burn and also burn the flour. Whisk in the flour. Cook it for at least a minute to remove the raw flour flavour. It is important that the flour is totally covered in the fat to avoid lumps. This is called a roux. Add 1 1/2 cup of the giblet stock and whisk. When adding liquids to a roux, it is important that they are not chilled since the roux is hot and you will cause the roux to ‘cease’. Adding the liquid in stages means that the liquid will incorporate into the roux more easily. Continue to add in batches until all the giblet stock is used. Add the pan drippings that have been separated from the fat. Bring your gravy to a boil to thicken. The thickness of a gravy is a personal thing. 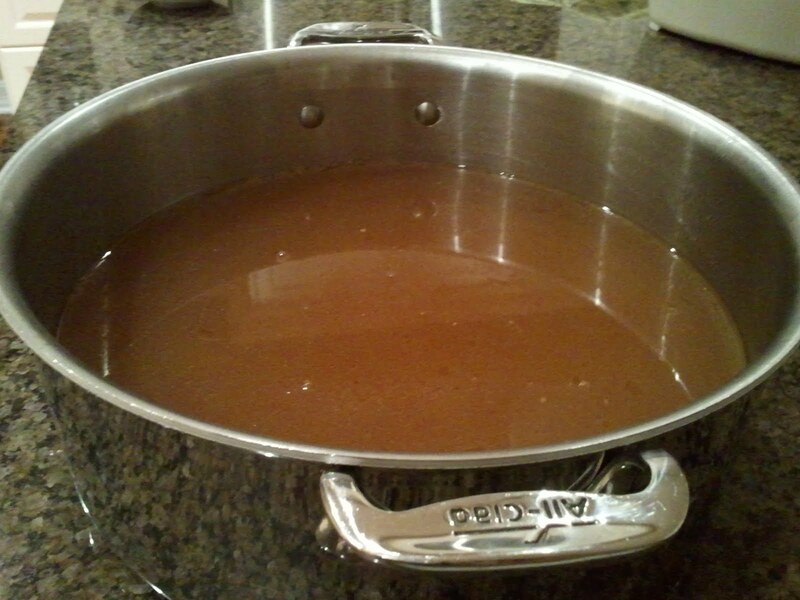 I will now add turkey stock (or chicken) to bring the gravy to the consistency our family enjoys. Sometimes I add a bit more wine. 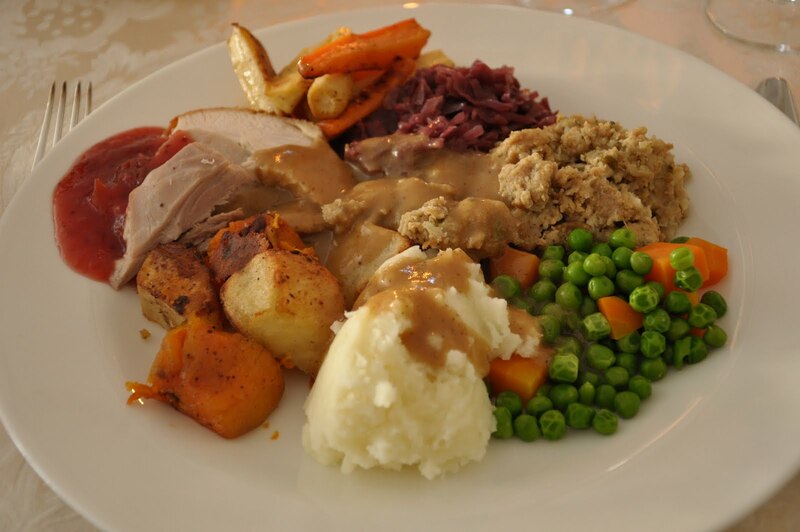 The water from the boiled potatoes or peas and carrots are also great liquids to use for finishing your gravy to get it to your desired consistency. I don’t typically do this with gravy but I like to for turkey gravy. I put the gravy through fine sieve into another pot, working the sieve with a whisk to push all the goodness through. This is mainly due to the ‘chunks’ of drippings from the roasting pan. I like a very silky turkey gravy. On the off chance you had problems with lumps, this will catch those too. I roast my turkey the day before I serve it. I also make the gravy the day before. This allows me the time to fuss as much as I want with the gravy as I am not under a time crunch. I think that extra day really does wonderful things for the flavour of the gravy. Much like a stew or chili or soup that sits for a day. 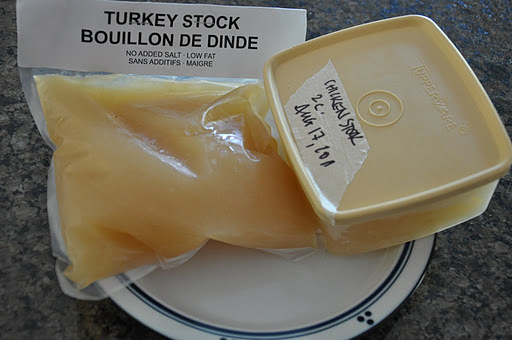 I use turkey stock from the Glebe Meat Market in my giblet stock recipe. They sell 500 mL bags. Sometimes fresh, sometimes frozen. Because I make the turkey the day before serving, I also make turkey stock that day once I have the meat off the carcass. If I need to thin out my gravy for the meal, I will use the turkey stock that I made the day before with the roast and the gravy starter. Serve your gravy piping hot.